A tour around one or more of the islands off the west coast of Ireland can last for as little as a couple of hours to a full day excursion. This can be tailored to meet most requests and we can offer refreshments on board such as soup, coffee and tea and we also have a toasted sandwich maker and microwave oven if you wish to enhance the picnic you have brought. The alternative would be to call into one of the islands for lunch in either café or hotel restaurant, the choice is entirely yours. Combining some touring with a little angling is again perfectly possible. All of our western shores are hit by winter storms and this can make for a very rugged Connemara coastline indeed. 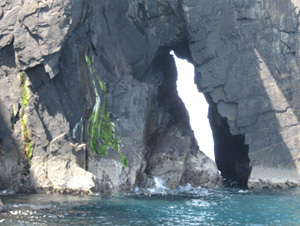 Over millennia this has produced some magnificent features of both cliffs, rocks and islets. The most spectacular of these must be Inishturk and Clare island’s western shore. Both offer very high cliffs especially Clare Island, where on calm days I have brought the Brazen Hussy close in under these cliffs, within a few yards of their base, and when looking up have marvelled at Fulmars coming off their nests some 700 feet or more above me. At Inishturk the Twin Sisters, a pair of triangular rocks rear a hundred feet out of the ocean beside the island and are a sight for anyone worth recording. At the East End Village, a location already mentioned for Artists and Bathers, there is a pier where in past times the herring caught by fishermen were processed, barrelled and then shipped out to Europe by a fleet of Galway Hookers, the single masted ocean going truck of the 19th century. These vessels are still to be seen in this region, now privately owned and treasured and raced on several occasions during the year. They and their smaller relations the Gleoiteog and Pucan all working boats in their time. 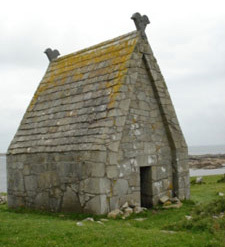 Most notable location for these boats to be seen are off St. MacDara’s island where the chapel remains to this religious figure from Irish history and this Chapel on the tiny island is renowned for its stone roof. Also within this sphere is Caher Island, translated from Irish means City of the Saints. This island has been a regular place of pilgrimage over the century’s and a local pilgrimage is made every August 15th. The remains of an enclosure, monastery and chapel may be seen there. 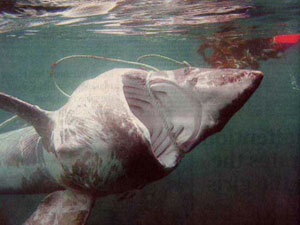 While I am at sea I often can treasure the moments where the larger of fish species pay visits to the surface. On very calm days, usually after a period of warm weather there will be an explosion of microscopic life. These are plankton, long light brown strings of miniature life in a soup like swirl, feeding a huge number of our oceanic species. Most notable among these are the baleen whales but also on the surface will come another visitor to our shores which is the Basking Shark. On the surface you will see a large dorsal fin and several feet behind, the tip of its tail moving left and right as it propels it’s way through the water. These fish grow up to 30 feet in length with an enormous mouth capable of taking in huge quantities of seawater which they then sieve through their gills removing the microscopic animal life on which they feed. Also to be seen frequently in our waters are Sunfish who feed at great depth where it is very cold on a variety of marine life, and then come to the surface to warm themselves. The tell tail sign of a Sunfish on the surface is a tall narrow fin flopping to and fro and if one approaches quietly, the fish attached is often of considerable size as they are known to grow up to 7 feet and 900 lbs in weight. We have also had a continuing visit during May of small numbers of Killer Whales or Orca. These northern Atlantic variety of the species are said to be wholly fish eating though I’m not so sure that this is the case. They have appeared in our waters coinciding with the appearance of young seal pups for the last three years and my suspicions are aroused as these mighty hunters are well known to feed on seal pups elsewhere in the world. Whatever the reason, they are a wonderful member of the Cetacean species. Together with these there are several different species of Dolphin that may be seen hereabouts. Bottlenose which seem to be the type best known by people on board, Common which are smaller and have been seen in very large numbers here. Russo which are larger and a variety of colours and patterns but quite shy by contrast to the others and finally Porpoises who are really quite small compared to the Dolphin but to be seen in pods of 10 to 20 and when not being harassed by their larger cousins, will play on the bows of our boats.